Palestinian Authority (PA) Chairman Mahmoud Abbas - often lauded in the international community as a "peace partner" for Israel - on Wednesday called for terrorist "martyrs" to prevent "filthy" Jews from visiting the Temple Mount, the holiest site in Judaism. 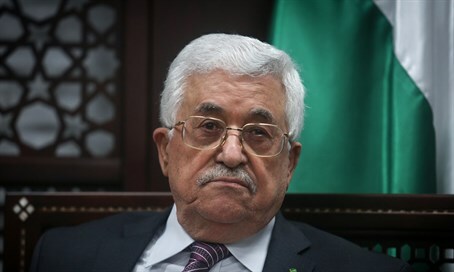 Abbas's comments, which came following rioting by radical Islamists at the Al-Aqsa Mosque on the Mount that spanned ever since Sunday evening during the Rosh Hashanah holiday, were broadcast on official PA TV and posted to his official website, and were translated Thursday by Palestinian Media Watch (PMW). "The Al-Aqsa (Mosque) is ours, the Church of the Holy Sepulchre is ours, and they (Jews) have no right to defile it with their filthy feet. We will not allow them to, and we will do everything in our power to protect Jerusalem," said Abbas. "We bless every drop of blood that has been spilled for Jerusalem, which is clean and pure blood, blood spilled for Allah, Allah willing. Every martyr will reach Paradise, and everyone wounded will be rewarded by Allah," he added, in a clear call for terrorist "martyrs" who die during attacks against Jews. "Abbas showed which side he's on"
Foreign Ministry Director-General Dr. Dore Gold responded to Abbas's comments on Thursday, saying, "today the world is divided between those trying to destabilize the coexistence, and between those trying to preserve it." "In his statement that Jewish visitors defile the Temple Mount 'with their filthy feet,' Mahmoud Abbas revealed which side he is on." In his comments, Abbas mentioned by name the murabitin group of Islamist extremists who harass Jews and attack police on a regular basis on the Mount, and who just last week were banned from the site. The group is funded by Hamas and the Islamist Movement in Israel. Murabitin are defined as "those carrying out ribat, religious conflict/war to protect land claimed to be Islamic," according to PMW. Just last October Abbas called to block Jews from "defiling" the Temple Mount by "all means necessary." Last November Mahmoud Al-Habbash, PA Supreme Sharia (Islamic law) Judge and Abbas's adviser, said on PA TV that Abbas was indeed "inciting the people in Jerusalem to ribat" and spark a religious war. Abbas repeated his call for religious war over the Temple Mount in an open letter to Palestinian Arab students this July.